In this installment, we’ll hop around between three regions in Italy exploring signs we’ve seen in the last few months. The key words for this installment: cascatista, piedone, esbosco, fiocco, alcool, spaccio and corona del rosario. Aren't you the least bit curious? Left: A sign indicating trail for ice climbers, cascatisti. Center: A sign showing different ice cream flavors including a 'big foot' or piedone. 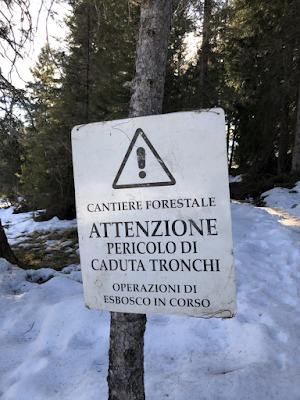 Right: A sign warning of forest clearing or esbosco. Pista per pedoni e cascatisti – Trail for walkers and ice climbers. A cascatista is someone who climbs on frozen waterfalls (cascate). We saw this sign while walking in Valnontey (location), which is the last town before entering the Grand Paradiso park. It’s an area popular for cross country skiing and ice climbing. In fact, this area in the Valle d’Aosta region is renowned for the number of frozen waterfalls found here in winter. The word cascatista seems to be a relatively new as it is difficult to find many sure definitions for it. It also seems related to the term ghiacciatore which means “a climber who practices climbing on ice falls or dry tooling”. Piedone, senza glutine – The big foot, without gluten. While getting a coffee in Valnontey, we saw this sign for ice cream which included an ice cream shaped and colored like a foot called the piedone. Is it a huge seller? What does it taste like? Operazioni di esbosco in corso – Forest clearing in progress. Let’s jump from Valnontey in Valle d’Aosta to Madonna di Compiglio in Trentino-Alto Adige. Of the 20 regions in Italy, five are autonomous including Valle d’Aosta and Trentino-Alto Adige. The other three autonomous regions are Sicily, Sardinia, and Friuli-Venezia Giula. What does it mean to be autonomous? It means that these regions have more legislative, administrative, and financial power than the other 15 non-autonomous regions. Back to the sign: during our sunny, winter day walk above Madonna di Campiglio, we were heading to Malga Ritorto and Rifugio Nambino (see Three Short Winter Hikes in Madonna di Campiglio). On the way up to Malga Ritorto, we spotted this sign with its curious use of the word esbosco, which means the clearing and transporting of felled tree trunks to a place where they are collected and loaded onto vehicles. It is a specialized term and rarely used that is composed of the prefix es – a prefix used to indicate the opposite of the word it precedes – and bosco meaning forest. Fiocchi or birth announcements in the Santurio Regina Pacis in Boves, Italy. Now, we are in the province of Cuneo in the region of Piedmont. Specifically, we are at the Santuario Regina Pacis in Boves, Cuneo. Inside the church, we were given an impromptu tour by a distant cousin. We stopped to look at the fiocchi – which are a kind of birth announcement that is common in Italy. Pink for girls and blue for boys. You often see them outside of houses where there is a newborn, attached to a door or fence. Attempts at a translation is discussed in this WordReference thread. The purpose of these garland-announcements? One purpose is to express parents’ joy and serve as an announcement for those waiting for the birth. Another less obvious purpose – and routed farther back in time – is to protect the newborn and ward off evil. Left: A sign warning not to spray my dog with alcohol. Center: Headline of prosciutto crudo di Cuneo sperm scandal. Right: Venchi chocolate outlet - they are dealing. Ricordo che spruzzare alcool sul mio cane è reato – Remember that spraying my dog with alcohol is a crime. This sign was seen in Cuneo on the enchanting little street In Cuneo called Contrada Mondovì. This area of Cuneo is rich in history and interesting shops and restaurants. It also contains a synagogue (Sinagoga di Cuneo) testimony to a Jewish community dating back to the 1400s. While none of this has to do with this sign, I couldn’t get the sign's implied action out of my mind. Who carries alcohol in a spray bottle? How did the dog’s owner know it was alcohol? What it alcohol to drink maybe? So many questions. Prosciutto crudo Cuneo da maiali fecondati col seme di suini danesi, inchiesta della procura – Prosciutto crudo of Cuneo from pigs inseminated with sperm of Danish pigs, investigation by prosecutor’s office. We were ambling along the beautiful via Roma in Cuneo under the portici when we came across this sign announcing a local newspaper headline. Our first thought was “only in Italy!” Our second thought was “so what’s the big deal?” Well, it is a big deal. Prosciutto Crudo di Cuneo is designated as D.O.P. (denominazione di origine protetta) meaning that the crudo comes from pigs are bred within a certain area and according to traditions. The D.O.P. mark is prestigious and products with it garner a higher price. All that is fine and good, but what does that all mean if the sperm is shipped in from elsewhere? Should it still have the D.O.P. designation? The Danish sperm is from pigs that are more productive and maybe there was a hope to up the production of Crudo di Cuneo? Stay tuned. Spaccio cioccolato – Chocolate outlet. Northeast of Cuneo, in Castelletto Stura, is the home of Venchi production facility and its outlet store. We hate shopping in general, and especially you wouldn’t catch us dead in anything with the label “outlet”. Furthermore, in Italian, spaccio means outlet but also trafficking in something illegal, especially drugs. In our experience, we’ve seen the word spaccio used much more often in the illegal sense. Spaccio di droga is drug dealing. A drug dealer is called a spacciatore. We bring this up as a roundabout way of saying that the big sign indicating spaccio above the entrance immediately had an ominous appearance to us. However, this is about chocolate, especially Venchi chocolate – one of our favorites, so we put aside our misgivings and entered. As an experience, we’d rate it 6/10. Sure, the chocolate is cheaper but not by much. Our biggest complaint is that the space is a bit natty and in one case I swear we bought old chocolate. Do the experiment yourself. Stop at the outlet and then shop at Relais Cuba Chocolat in the center of Cuneo. Cuba sells only Venchi and the experience there is much more magical. The folks at the outlet shop should take note. A sign announcing lost rosary beads in the Occitania. È stata smarrita a Chianale una corona del rosario di Lourdes - Lost at Chianale: rosary beads from Lourdes. One day during an extended stay in Cuneo, we took a day trip to Chianale (Pontechianale) which is found in the Valle Varaita, on the border with France. The Valle Varaita is one of the Occitan Valleys, a territory where the Occitan language is spoken. Chianale is recognized as one of I Borghi più belli d'Italia – the most beautiful small towns of Italy. As we strolled the tiny town, we saw this sign for a lost rosary. Rosary beads are referred to in Italian as corona del rosario. The lost rosary beads are from Lourdes, which is historically also part of the Occitania region.